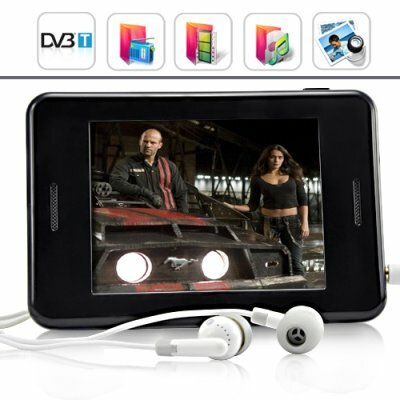 Successfully Added Media Mogul - MP6 Player with 3.5 Inch Touchscreen + DVB-T to your Shopping Cart. What is a Media Mogul? It's a truly complete digital media player that handles MP3 + MP4 + MP5 + MP6 functions like a pro! With features such as native playback of AVI, RMVB, FLAC, DIVX plus many other popular formats, DVB-T reception (yes it's got a built-in digital TV receiver), a crystal clear 3.5 inch touchscreen display, and 8GB internal memory, The Media Mogul emphasizes design and functionality and is the perfect portable entertainment unit for anyone who demands the finest digital media experience on the go! The Media Mogul is a PMP that does more than the iPod, Zune, and all of those other "name brand" players put together! More importantly, there is no proprietary software necessary or DRM restrictions to worry about. Simply load your files onto this MP6 player like you would a USB flash drive with a simple USB connection to your computer. No iTunes software necessary!!! It comes with a huge 8 gigabytes of built-in flash memory so you can store all of your favorite media files, has a microSD card slot which supports another 8GB of memory which brings your potential file storage capacity up to 16 GB! The E80 handheld multimedia MP6 Player features simple one-click navigation menus and it is made of a finely detailed molded casing with a polycarb front panel to protect the inner screen. Such thoughtful details will provide you with the most satisfying user experience possible whether you are sitting on the bus or lying on the beach. A simple and elegant portable multimedia MP6 Player (MP3 + MP4 + MP5 = MP6) the CVMI-E80 does movies, music, digital TV, radio, photos, ebooks and more in one amazing unit. Get yours today at a low factory direct low China Wholesale Price from the leader in wholesale electronics, Chinavasion. Photo viewer and sound recorder! Like the world famous Video File King MP6 Player, supports 20 file types! Multiple video supported formats, including RMVB, VOB, DAT, AVI, and much more! What makes this MP3 / MP4 player better than others I see in my local electronics store? THE MEDIA MOGUL is called an MP6 player, what is that? Is it like an MP5 player? There are no such things as MP5 files, so no product can be an MP5 player. However, this product has all the features you see in advertised MP5 + MP4 + MP3 players, and much more, hence it is called an MP6 player. Actually, The Media Mogul is so good we should be calling it an MP10 player! What type of DVB-T broadcasts will this unit receive: MPEG-2 or MPEG-4 encoded streams? on 2011-10-22 08:21:50 Produto Excelente!!! A qualidade do produto é ótima a resulação de vídeo é execente, coloquei filmes em (.avi) e (.rmvb) e achei execente a resolução!. Apesar de ser um mp5 (isso mesmo mp5 e não mp6 - atenção administradores do site!) é o que vem escrito no manual e na caixinha, ele não reproduz arquivos de vídeo no formato (.MP4), o que não desvaloriza o produto, pois ele reproduz arquivos em (.avi) e (.rmvb) que são os mais populares em sites de download de filmes por ocuparem menos espaços! Como comprei, justamente, por ele reproduzir (.avi) e (.rmvb) estou muito satisfeito com o produto e o recomendo a outros compradores considerando as observações citadas. p.s. : O produto me foi enviado pelo Chinavasion como "gift" de pessoa física para pessoa física e com o valor declarado abaixo de 50 dólares - resultado não paguei nenhum imposto heheheh! on 2011-10-22 08:21:06 Produto Excelente!! !